Dying grass is a clear sign that your soil may be tapped of nutrients, and it's also a real eyesore. By tilling and enriching their ground, you can give new sod a proper mix of native soil and new soil, ensuring a green lawn and healthy plants. As much as homeowners like a well-kept lawn, they don’t want to drag the hose out to their yard every morning at 5 a.m. The addition of a new sprinkler and irrigation system instantly boosts a home’s market value in an established neighborhood while keeping new plantings green and the lawn low-maintenance. Shade trees can cool a house considerably and save on air conditioning costs. Planting shade trees in a sunny area is not only a beautiful addition to the yard, but as the trees grow, they will shade the house too. Keeping with the style of the neighborhood is important to keep in mind when updating a landscape, because this is the first thing people will see. 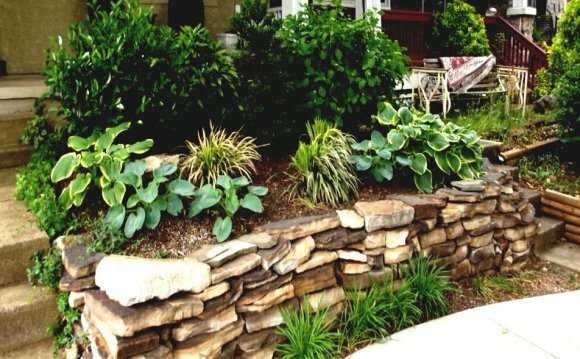 A rock-retaining wall and natural playground are tasteful and modern additions to landscaping.